I set up another bike ride today. There were less people, but it still was fun. I'm going to try and ride more often. It's really fun, and I like riding on my own, because I can stop and look at things. I also like the organized rides because it's fun to ride far, and I rarely ride far when I ride by myself because I keep stopping and looking at things. 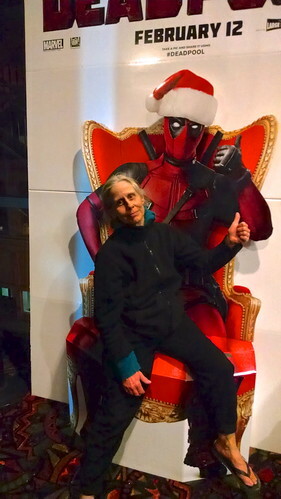 In other news, I saw the movie Deadpool earlier this week and it was really great. Whe G first told me about Deadpool, I thought he was making him up. It was just such a crazy idea for a character. Deadpool was made immortal via some experiment that also made him crazy. He is completely aware that he is a comic book character and occasionally he talks to the readers or refers to some aspect of being in a comic. He is not good in the usual comic-book hero kind of way. He may do good stuff, but he has no problem killing people who get in his way. He also has a raunchy sense of humor and is a bit of a potty mouth. The actor who plays him, Ryan Reynolds is perfect for the part. He completely owns the part. He also, as Deadpool, made a delightful PSA telling guys how to do self exams for testicular cancer. It's informative and raunchy, and it will probably help to save some lives. As the mother of a guy in the PSA's target demographic, I appreciate them making it. I linked to this PSA last week, but, in case you missed it, here it is again.